Luther regularly labelled superstition, Catholic dogma, and the beliefs of the Turks and the Jews, as ‘dreams’. ‘Lauter somnia’, pure dreams, was one of his favourite insults, and he liked nothing better than to debunk them. Yet Luther was also fascinated by signs and portents, and though he often joked about dreams, he too noted important dreams. 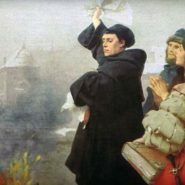 Dreams also happened to be recorded at key turning points of the Reformation, and they give rare insight into Luther’s deepest anxieties and feelings. Discussed collectively, Luther and his followers used dream interpretations to communicate concerns they did not discuss explicitly. This lecture explores how historians can make use of dreams to understand the subjectivity of people in the past. Date/Time: Monday 4 December, 6.15–7.30pm. Location: Room 153 (Forum Theatre), Level 1, Arts West North Wing, The University of Melbourne, Parkville. Subscribe to our Yahoo Group mailing list.